(a) In July, 1880 the prestigious science journal Nature (Vol. 22, pp. 290-291) published a letter from British spectroscopist J. Rand Capron in which he described his discovery and subsequent examination of multiple circular areas of flattened wheat on a farm in southern England. He describes areas of crop "forming ... circular spots [with] a few standing stalks as a centre, some prostrate stalks with their heads arranged pretty evenly in a direction forming a circle round the centre, and outside these a circular wall of stalks which [have] not suffered." Capron suggested that these flattened circles were the result of "some cyclonic wind action" and enclosed a sketch of the "most perfect" of these circles which, unfortunately, Nature did not publish. In 1686 an even earlier British account of geometric areas of flattened plants is found in A Natural History of Staffordshire, written by Professor Robert Plot, LLD, the first "keeper" of Oxford's Ashmolean Museum and a professor of chemistry at Oxford. Professor Plot describes not just circles, but flattened areas "obtaining three parts of a circle, others being Semicircular, some of them Quadrants." These various designs were found both in "arable grounds" and in "open pastures ... And not only in a single, but sometimes in double and treble Circle[s], one within the other." musty, rancid smell, but to the tast[e] insipid." The drawings which illustrate Plot's report (see above and below) are of rings, spirals and even squares within rings--all geometric forms which are appearing in the field today. And the professor's measurements of the flattened pathways ("seldom narrower than a foot, or much broader than a yard"), as well as the overall diameters of the formations ("near Fifty yards, whereas ... some of them [are] not above two yards [in] diameter") are also typical of a majority of circles we find today. Modern farmers and land-owners, in cases where the land has been in the family for generations, regularly recount that their fathers, grandfathers, and in some cases great-grandfathers, did find crop circles in their fields from time to time--often in the same fields now affected by the phenomenon. 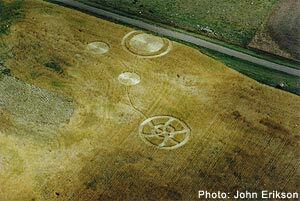 A few photographs also exist of English cropcircles which occurred in the early 1900s. Many of these crop circles seem to have been simple circles, or circles with rings, but some of them are reported to have been more complex in design. These anecdotal accounts have been obtained from farmers in several different countries in Western Europe and in North America and seem to rule out the idea that modern technology is responsible. Non-Geometric Crop Formations: Most people are also unaware that the anomalous plant changes documented in "geometric" crop formations (those in which a recognizable design is apparent) are also found in many cases of non-geometrically flattened crop. Called "lodging" by many farmers, and thought by them to be the result of intense weather systems impinging upon plants already weakened by over-fertilization (if too much nitrogen is applied to the growing crop the seed-heads grow larger and weigh more, thus making the plant-stalk more susceptible to wind and rain), this aspect of the cropcircle phenomenon has been largely ignored. circles of more "geometric" design. Real lodging--caused either by accidental over-fertilization in combination with subsequent weather damage or, in some cases, simply by heavy rain and wind alone--does occur in fields all over the world with some frequency. 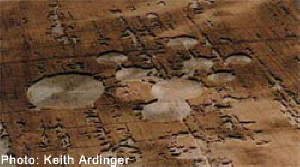 However, testing of quite a few of these non-geometrically flattened impressions (particularly when they are found in vicinities where geometric formations occur regularly) has in a number of cases revealed the same plant abnormalities found in "geometric" events -- and to a greater degree in most instances. In the more "geometric" crop formations the apical (first node beneath the seed-head) node-length increase tends to be no greater than about +95% to +115% as compared to the controls. But in many of the non-geometrically downed crop areas examined node-length increases of +200% or more, relative to the controls, have been measured. More expulsion cavities (holes blown out at the plant stem nodes) are also usually found, and occur more often in multiple nodes down the plant stem, and germination abnormalities are also frequently more pronounced. The evidence seems to indicate a more intense discharge of both the deleterious heating (microwave?) energy and the flattening force discharged in these chaotically-downed crop areas. Geometric and non-geometrically-downed crop in the same field. with, or overlying, recognizable designs in the fields. The crop formation above, at Alton Barnes in the U.K., is typical of many formations evaluated from multiple countries, in that the plants have been flattened in both a geometric design and (apparently simultaneously) in a random fashion in nearby areas of the field. 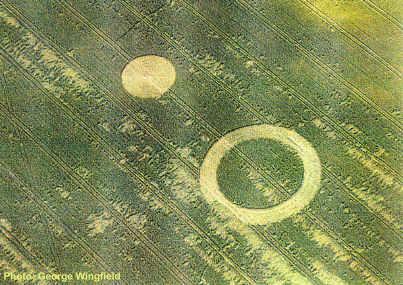 In a number of cases every summer geometric formations with clean, crisp edges have been discovered in fields which subsequently--often within one or two days--show evidence of having been re-visited by the circle-making energy system. When this multi-circle formation in Washington state (above, top) was first photographed on June 21, 1998 all of the circles had crisp, distinct edges--and there were only a few patches of randomly-downed crop in the rest of the field. When re-photographed on July 8th patches of randomly-downed crop covered the field, damaging the edges of many of the original circles. This sort of re-visitation of the energy system involved in creating circles has been seen in all countries studied so far. It is quite interesting to note that, in some cases, the revisitation can also produce additional geometric features--which seem to compliment the original design--rather than resulting in randomly-downed additions. 3. 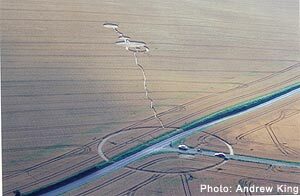 Geometric Additions & Boundary Crossing: The photo (below) of two formations which occurred in southern England during the summer, 1993, illustrates two little-known facts about crop circles: they occasionally do get geometric additions to the original design--and they do cross boundaries, in this case a roadway. of the pictogram had formed. In this 1993 case at Overton Road witnesses, who were watching the field at about 2 a.m. on the night after the long pictogram formed, observed a "white mist" move slowly across the field in which the pictogram sat. The mist crossed directly over the pictogram, disappearing into the East Kennet longbarrow (the only unexcavated longbarrow in southern England) at the edge of the field. The next day the witnesses returned to the site and saw that a new circle had been added to the long pictogram (circle at the top of the photo) and went into the field to investigate. The new circle was observed to have a standing center of wheat stalks but--while they were still examining this new addition--the plants in the center suddenly twisted around themselves and went down. No noise was heard and nothing seen to explain how this occurred. The large ring around the "T" junction had formed several weeks earlier and was accompanied by multiple tiny flattened circles randomly placed both inside and outside the ring. Although this sort of boundary-crossing is relatively rare, it does occur not only with roads, but with hedgerows and other landmarks. In some cases crop circles have been found which extend from one field into another one, in which a totally different crop is being grown. And there is also evidence that boundaries can interfere with the final design, as in the case (below) at Midale, Saskatchewan, in Canada, where the edge of the grass strip abutting the road seems to have abruptly truncated the formation of the ringed circle. Multiple crop formations at Midale, Saskatchewan, Canada in wheat, formed in early September, 1999. Large ringed circle partially aborted by grass strip alongside road. 4. 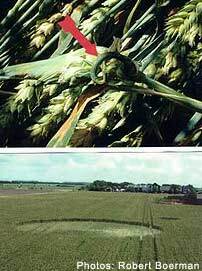 New Plant Abnormality: After nine years of examining crop circle plants from several hundred formations in multiple countries in western Europe, as well as in Israel, Canada and the U.S., a new plant anomaly was discovered in mid-August of 1999 in two separate formations near Avebury, England. A week later the same anomaly, although much more severe, was found in a large ring formation at Whitefish, Montana. The following summer, in August 2002, fieldworkers examining a new, pristine "dumbbell" formation in Moosomin, Saskatchewan documented a fourth case and--by 2003--several more cases had been found in crop circles in Holland. Severe twisting of somatic tissue at the base of the seed-head in a formation at Groote Keeten, Holland in July, 2002. This plant change, a massive spiraling and twisting of the somatic (non-reproductive) tissue in the peduncle (stem at the base of the seed-head), according to W.C. Levengood, would have to have occurred early on in the plant's developmental stage and could not have occurred at the same time as the actual flattening of the crop (which occurred in July or August, in all cases documented so far). It was Levengood's opinion that this anomaly must result from an exposure of the immature plants to some sort of damaging radiation--at a very early stage of development--many weeks prior to the actual flattening of the mature plants later on. This new observation -- and the fact that it suggests more than one exposure to some sort of unusual energy system -- raises a completely new question regarding the creation of crop circles: is there more than one stage in the creation of crop circles? Or at least some crop circles? Long-Term Growth Effects: Because the Wiltshire and Hampshire counties of southern England (where the largest number of crop formations are found each summer) are compact and relatively easy to traverse, as well as being located centrally for researchers in western Europe, the long-term effects of crop circles in these fields can be more easily observed. British photographers manage to document most, if not all, formations there each summer as they occur, so both the precise locations and dates of occurrence are recorded. Although no scientific study has yet been carried out to determine how many formations have some sort of long-term effect, it is clear anecdotally that most formations completely disappear once the field has been cut and plowed. In most cases the new crop planted in the fields which hosted crop circles the previous summer shows no apparent effect of the previous summer's event. The "Dolphin" (or triple-crescents) formation at Barbury Castle, July 23, 1999 (wheat). But in a small percentage of formations--both "simple" circles and events of quite complex design--there is clear visual evidence in the newly-planted field of the previous summer's crop circle. In some cases the new plants in the area where the crop circle had been will be a slightly different color, or they will be shorter, or taller, than the surrounding crop. In 1999 an elegant formation (dubbed the "Dolphin" by field-teams) occurred below the Iron Age hillfort known as Barbury Castle, a frequent site for circles over the years. This formation attracted attention for a number of reasons--not the least of which was the fact that strange balls of light were seen and videotaped flying over the formation in daylight. The following year, as the new crop began to grow in the field, the "ghost" of the 1999 formation could easily be seen, in spite of the fact that the field had been tilled and re-planted as usual. As the 2000 season progressed, the old formation was still visible because the growing plants inside the areas which had been flattened in 1999 were both a darker green in color than the rest of the crop, and they were at least 6-8 inches taller. 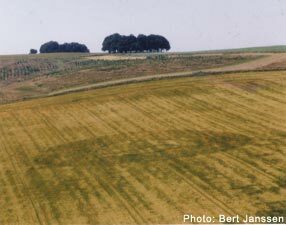 Clear imprint of 1999 Barbury Castle "Dolphin" formation in the early summer of 2000--field had been ploughed and re-planted. Top: August, 2000: Control plants from outside '99 formation area. Bottom: August, 2000: Sample plants from downed area inside 1999 "Dolphin," which are a darker green & taller than controls. In this case at Barbury Castle and in a few others which have been followed up the subsequent year, it appears that whatever caused the original crop circle affected something in the soils (down to at least a foot in depth) which, in turn, altered the growth habit of the seeds planted in the old impression-area the following year. In a case in Iowa where a circle had appeared in full-grown corn (maize), and where soybeans were planted in the same field the following year, the soybeans were observed to grow abnormally in the circle area, producing a decrease of 50% in the number of seed-pods present with a concurrent 200% increase in the number of root nodules. This result is inexplicable, particularly in light of the fact that increases in numbers of root nodules on soybean plants usually goes hand-in-hand with increased seed-pod yield--exactly the opposite of what occurred here. A perhaps more commonly observed long-term growth effect is apparent in the photos (below) of two different sets of formations which occurred in England in the summer of 2000. In early June, in one of the fields around Silbury Hill, a complex triangle-type formation in barley occurred over at least two nights (part of the formation occurred the first night, with modifications the next night). The following year a large bare patch of earth at exactly the same location was clearly visible throughout the summer, in which the newly planted crop refused to grow. That same year (2000, but later on in the summer) in a wheat field on the other side of Silbury Hill, a simple 3-circle event occurred (next to a more dramatic formation) which also resulted in a bare patch of field in that location in 2001--in spite of the fact that the entire field had been mowed, tilled, re-planted and fertilized as usual. This failure of crop to grow in locations where crop circles have been is the most common long-term growth effect generally known, but it is reported in a relatively small percentage of cases overall, although in several different countries. It appears that the effects are short-lived, lasting so far as we know no more than two years subsequent to the original formation. Two formations in another field near Silbury Hill (UK), late summer 2000. Bare spot in 2001 where 3-circle formation had been (new crop did grow where "star" had been). Long-term effects like these need to be evaluated scientifically since they clearly point to some obvious alteration of the soils--either permanent or semi-permanent--changes which, once understood, will provide a greater understanding of the causative mechanism behind the phenomenon: basic chemical analyses of the soil and an examination of various soil microbes would likely be useful. Wilted Stems: A few cases of strangely dried-out, partially wilted stems have been seen in standing plants within crop formations. In several of these incidents the standing plants so affected have been part of a small, attendant "signature" formation near the larger, primary formation. These "signatures" are seen only occasionally, usually in conjunction with larger formations, and are often simply an array of small circles in a specific arrangement. Sometimes, as here, they are more elaborate, and quite intriguing. Although many people are certain that the presence of such a "signature" is a sure sign of hoaxing, they have not been systematically studied, so no final conclusions can be drawn. 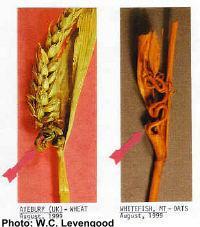 Plant stem from "signature," at Cherhill (UK), 1999, dehydrated just below the seed-head. Cherhill (UK), 1999 formation and "signature" (red arrow). 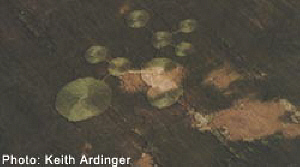 In this case, at Cherhill in Wiltshire (UK) in 1999, a very small tuft of standing plants inside the circular area of the "signature" were dehydrated just below the seed-heads for a distance of only a few inches, showing a loss of chlorophyll. No similar damage was found elsewhere on the plants and no other wilted stems were observed anywhere else in any part of the formation. The Aquifer Connection: During the mid-1990s two British researchers, Glenn Broughton (now living in Vermont) and Steve Page, wondered why crop circles occur in some locations (in many cases year after year) and not in others? 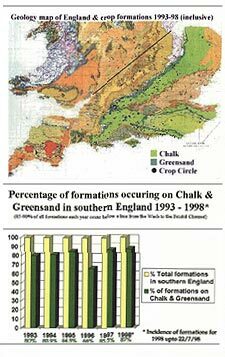 By plotting crop circle occurrence on a geological map of southern England they were able to demonstrate that an overwhelming majority of British crop circles during the years 1993-98 occurred over aquifers lying beneath either deep deposits of chalk or greensand. For more details see "Aquifer Research" (page 2) on the BLT Research Links page. Chalk is a highly porous rock. BLT's John Burke suspected that the Spring rainwater percolating slowly down through the chalk over the summer months might increase the ground electrical charge in these areas as the summer progressed. He further speculated that this increase in ground electrical charge might be enough to function as an attractor to the complex upper atmospheric plasma system hypothesized by W.C. Levengood as the causative agency behind crop circles--and, further, that this would be particularly evident along the edges of the chalk layers, where the surface water has farther to travel to reach the underground aquifer. Repeated ground-electrical-charge measurements were carried out over several summers in southern England in the early 1990s, in areas where crop circles regularly occur. It was found that the ground-electrical-charge did increase as the summer progressed (and as the aquifer below the chalk lowered), thus increasing the likelihood that ground-electrical-charge might be an "attractor" to the hypothesized atmospheric energy system--the increase in ground electrical charge, although slight, might explain why at least some of the circles occur where they do. When Burke examined a graph of water-table levels in the Wiltshire area of the U.K. for the recent years during which crop circles have been reported, he discovered another interesting fact: the British Water Authority had, in two specific years, begun to pump the aquifer during the summer months and it was during those two years (when the aquifer was at it's lowest point) that the greatest number of crop circles had been reported. A number of researchers have raised the question as to whether or not a magnetic anomaly in the earth's crust might account for the question of "why" crop circles occur so often in certain locations and not in others. A German team, using a geomagetometer, mapped out several British fields in which crop circles existed, and found that there were magnetic anomalies in the earth's crust in most of these fields--but not necessarily directly beneath the circles themselves. This German study was not published and all of the details are not available, but more work along these lines might clarify a possible connection. Light Phenomena: Ever since people began paying attention to crop circles strange balls of light (BOLs), frequently softball-size but sometimes smaller or larger, have been regularly seen, photographed and/or videotaped in and around the fields the circles historically are known to frequent. These BOLs are seen in daytime as well as at night, and have now been observed (and in many cases videotaped) in every country where crop circles are studied. In England in the late 1980s and early 1990s sightings of soccer-ball-sized orangey light balls, drifting over the valleys and fields near Alton Barnes at night, were observed so often they were dubbed "Amber Gamblers" by local observers. Smaller, tennis-ball-size, almost translucent BOLS have been both photographed (see below) and videotaped, and they have been seen and documented in various degrees of opacity and in different colors. 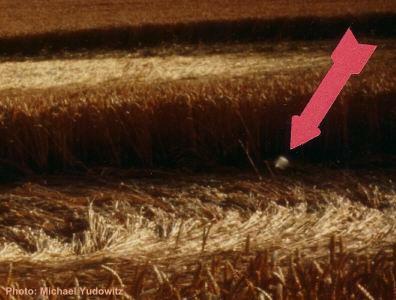 Small semi-transparent sphere, typical of one type of light anomoly frequently seen in and near crop circles (1995-Devizes, UK). 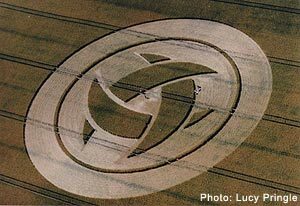 Often the light phenomena are observed inside, or flying over, crop circles which are present already; they frequently appear to be "inspecting" the formation, weaving back and forth and up and down, sometimes right over the heads of people who are in the field at the time. In one case (which was videotaped by British circle photographer, Steve Alexander) a small, flashing BOL which had been weaving in and out of a formation near Milk Hill in Wiltshire for several minutes in broad daylight, left the circle and began to head across the field toward a farm-hand on a tractor at least a quarter-of-a-mile away. As the BOL moved farther away it rose up a few meters above the crop surface, flying quite close to the tractor-driver's head. In Steve's video you can see the driver turn his head to watch the BOL as it disappeared in the distance. In another videotape, also shot in daytime and in the Wiltshire area, a bird--a hawk, apparently intent upon what it thought was "dinner"--dives straight down toward a moving, fairly opaque BOL, only to veer away at the last moment, as it realizes that the low-flying light is NOT something edible. Because the video was shot from a vantage-point quite different from the hawk's, and because it is clear that the bird is diving on the same object captured by the camera, we can be relatively certain that this BOL was three-dimensional (not a reflection) and moving (the hawk's trajectory makes this obvious). One wonders what the hawk saw as it veered away. People photographing in crop circles at night regularly discover light-ball and other anomalies in the photographs they've taken inside and near the circles. Many of these photos are of single or multiple "orbs" of light, in varying degrees of opacity; in some cases the photo anomaly looks like a cluster of light balls which is moving. In a few cases literally hundreds of tiny spheres, of varying colors, have appeared on the prints. Two first-time visitors to a crop formation in Logan, Utah in 1996 not only observed--they interacted with--multiple 2-3 inch diameter "dancing" light-balls inside the formation for an hour or so, and even managed to get a photograph (See "Addendum," at http://www.bltresearch.com/labreports/logan.php). Most often the photographers do not see these "orbs" which appear on their photos, but in some cases either flashes of light or actual orbs are observed by the photographers. And it is reported in a few cases that, when multiple cameras are aimed and triggered simultaneously, the same "orb" anomalies have been obtained on several different cameras. It is known that tiny specks of dust, or droplets of moisture in the air, or even small insects flying too close to the lens can produce similar photo anomalies, as the light from the camera's flash is reflected back onto the film. However, it is not clear that all of these photo anomalies can be so easily explained; it is also curious that most of the people who find these "orbs" on their photos, find them primarily on shots taken in, or near, crop circles. Furthermore, these effects are generally noted much more frequently in newly-formed crop formations--even when much older crop circles are visited and also photographed on the same night, under the same weather conditions, using the same film, etc. 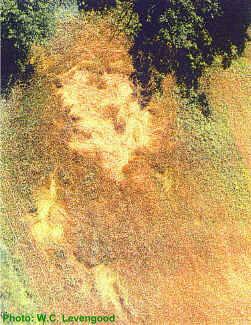 Photo anomaly, typical of type frequently obtained at new crop circle sites in night-time flash photos--which may be associated with dust particles close to the camera lens. Each summer reports come in from farmers, research field-personnel and the general public of bizarre--and clearly visible--light phenomena which seem to be involved in the creation of new crop circles. Over the years these witnesses have reported balls of light, discs of light, and/or columns of light over fields in which new formations are subsequently found. Perhaps the most astounding "light phenomena" photographs yet taken in and around crop circles have been captured by a young Dutch medium, Robbert van den Broeke (http://www.bltresearch.com/robbert.php). Robbert has for many years observed highly unusual events in the fields near his home in Hoeven, where in the mid-1990s he first watched multiple light-balls circling over a field where a new crop circle subsequently formed. 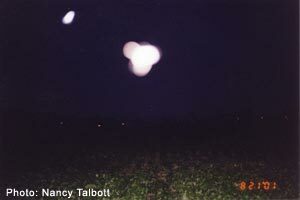 One spectacular incident in 2001, which BLT President Nancy Talbott also witnessed, involved three highly-energetic light "tubes" spiraling into a bean-field, creating a new circle (http://www.bltresearch.com/eyewitness/eyewitness1.php). 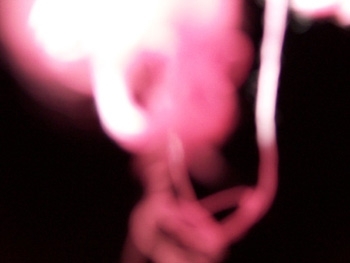 One of many "light phenomena" photos captured by Robbert v/d Broeke while using Dr. William Roll's camera in 2008. 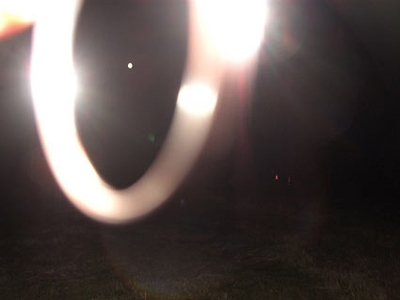 One of multiple "light rings" photographed by Robbert v/d Broeke in 2007, this one while using a visiting German researcher's camera. In addition to witnessing many crop circles forming, Robbert has taken thousands of very different and highly anomalous photographs in these crop circle fields over the years, a wide variety of which are presented in a 5-part report posted in 2009: http://www.bltresearch.com/robbert/photoanoms1.php. Equipment Failure: Although no thorough scientific study has yet evaluated this constantly reported effect, the failure of electrical and mechanical equipment in, near, or flying over crop circles occurs so often as to be considered almost normal by seasoned field personnel. Cameras, recording devises, cell phones and even tractors out in the field harvesting (when many circles, particularly in North America, are first discovered) regularly fail to operate. Quite a few crop circles in full-grown corn in the U.S. have been discovered by startled farmers whose harvesting equipment suddenly stops cold as they happen upon a flattened formation. Now that cell phones are so ubiquitous, reports of their failure to operate inside crop circles are heard every summer; in some of these cases the phones have been taken outside the formation and found to work perfectly, but when taken back inside again do not function. Crop circle photographers, both professional and first-time visitors, report every summer unexplained malfunctions of their equipment--in some cases finding the cameras damaged beyond repair. There have also been multiple incidences of professional TV News cameras suddenly failing inside crop formations. And there have even been a number of reports--one spectacularly documented--of cameras refusing to function when directly over a new formation in an airplane. In the case so well-documented, both a digital and a film camera were being used by a professional photographer trying to get aerial shots of a new formation on the second day after it appeared. As her helicopter descended from about 500' above the new formation she noticed on her digital camera screen that the image was losing color--the lower the helicopter went, the more black-and-white the image became. As the plane went back up to 500' the color returned on the digital screen. What was even more interesting was the fact that the film from the 35 mm camera, when later developed, showed not just a loss of color as the plane descended, but an almost total loss of image altogether. As the plane descended below 500' the film image simply began to disappear, until at about 250' there was only a trace of the formation on the film. This, too, reversed itself as the plane climbed back to 500' and then repeated itself as the plane again descended. It seems that, in this case at least, we have to consider that some sort of remnant radiation--which was emanating from the crop formation area upwards to about 450'--was still present, and was affecting both the digital and the 35 mm cameras. The helicopter engine was not affected, although many people visiting this formation on the ground during the first few days after it appeared reported having to leave the formation because of feeling ill or dizzy. In some crop circles we have also documented that compasses will either consistently deviate 10-20 degrees from North inside the flattened areas or will spin wildly, both when held at chest height and when placed flat on the ground. Pilots have also reported compass deviations when flying directly over new formations. Finally, witnesses living near fields in which crop circles have formed often report TV, cell phone, smoke alarm and security device interference or malfunction during the nights when it is later ascertained a nearby crop circle was formed. In some cases they also report hearing unusual buzzing or humming noises, either alone or in conjunction with "strange lights" shining into, next to, or above their homes. Often these reports are made in conjunction with reports of unusual animal behavior. Animal & Human Reactions: Numerous anecdotal reports exist of unusual animal and/or human response either at the time it is thought that new crop formations have occurred nearby, or upon entering new circles that have been discovered. Flights of geese have been observed to break formation directly over crop circles, reforming their "V" pattern once past the formation, and deer have been watched circumventing crop circles which were placed so as to block habitual game trails across fields. Farmers frequently report unusual disturbances among farm animals during nights when crop circles form nearby, particularly reporting that their cattle bellow loudly and/or their dogs bark unabatedly for hours. In the fields, some domestic dogs have refused to enter formations while others have reportedly become quite sick after being in a formation -- and, in other cases, dogs have shown no adverse effects at all, exhibiting completely normal behavior while in crop circles and afterwards. A wide range of anecdotal reports exists of the effects on people. Again, these reports have not been scientifically evaluated, but it seems clear that many people experience unusual physical effects in some crop formations -- and, again, most often when the crop circles are relatively new. These effects range from the unpleasant ("splitting" headaches, dizziness, disorientation, heart palpitations, a sense of "dread") to the euphoric (a strong sense of "peace," a feeling of joy, a sense of "oneness," and a feeling of love) and, in the 1996 "Julia Set" formation near Stonehenge, to the really bizarre. After visiting the "Julia Set," a lovely 915 ft. long fractal spiral made up of 149 circles of varying diameters, more than a dozen women reported menstrual abnormalities, the most unusual of which was the reoccurrence in several post-menopausal women of their previous normal menstrual cycles. Over the years a strange "electronic buzzing" noise has been heard by a number of people inside crop circles, in daytime and at night, and this sound was tape-recorded on one occasion. Many people have also experienced the sensation of a presence of some sort -- other than their own, and invisible -- while inside crop circles, and crunching sounds like "footsteps" have been heard by several people on more than one occasion while in circles when there was no one else present. It is easy, perhaps, to dismiss such reports as being due to some sort of hysteria or over-excitement, and there seems to be no evidence of long-term effect to either people or animals. However, the fact is that a large number of field personnel who have spent considerable time in the formations, as well as some of the more casual visitors, have experienced one or several of these effects in crop circles all over the world. The fact that most of these experiences are reported in newly-formed crop circles suggests there may be a remnant energy still present at some of these sites, to which at least some people are sensitive. It is most interesting that these effects do not seem to be present at all crop circles, and that, even when some people are affected in a particular event, other visitors will be unaware of anything unusual at all.